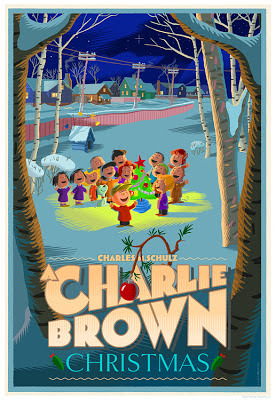 Dark Hall Mansion are back with two fabulous new limited edition prints based on scenes from A Charlie Brown Christmas. Laurent Durieux's two creations each have a distinctive style and feel while remaining true to the spirit of the television special, and are full of fine details and nifty small touches - be sure to click on the images below view them at a larger size (or visit Dark Hall Mansion's website for even larger versions); the small thumbnails don't do the artwork justice. Both officially licensed, numbered editions measure 18" x 24". The standard edition of 300 prints are hand-pulled screenprints, and the variant edition of 50 prints are glicee prints on Moab Entrada Bright White 290 gsm. There will also be a 10-print wood edition of the standard artwork on maple wood, and a 10-print canvas edition with the variant artwork. 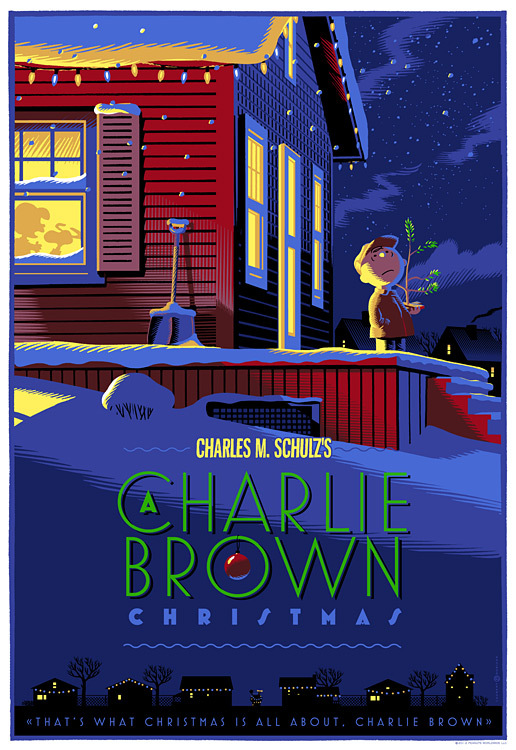 The new A Charlie Brown Christmas prints go on sale Friday, November 9, 2012 at 9:30 AM (Pacific time) at Dark Hall Mansion's webstore. 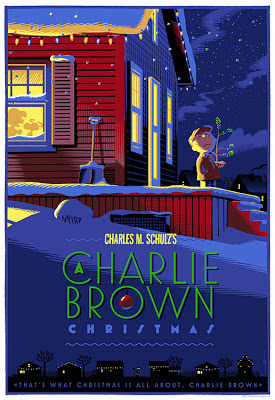 Dark Hall Mansion's limited edition Peanuts prints sell very quickly, so make your orders promptly. Update: These prints are now sold out. For more information and larger pictures of the artwork, visit Dark Hall Mansion's blog, and visit their Facebook page for behind-the-scenes photos.